The Florida rental agreements are to be written between a landlord and tenant for any type of commercial or residential property. The forms make the designation that a landlord, or an owner of property, is allowing a tenant, or lessee, to use the premises for a specified amount of time in exchange for payment. All contracts are to be made under the State Statutes (Chapter 83 – Landlord and Tenant) and upon the authorization and acceptance of both parties the document becomes legal. Rental Application – Used by a landlord, or their agent, to verify the credentials of a tenant including their employment, credit, and any other additional details. Association of Realtors Agreement – Standard Residential agreement approved by the Florida Association of Realtors. Commercial Lease Agreement – For a business-oriented use that may be for any type of retail, office, or industrial space. Condominium Lease Agreement – For any type of condo or cooperative unit for a period of a maximum of one (1) year. Lease to Own (Option to Purchase) Agreement – Standard form with the benefit of having an option to purchase the property. Month to Month Rental Agreement – No end date between a residential landlord and tenant. 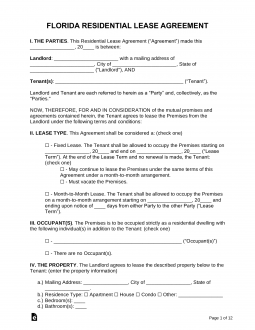 Roommate (Room Rental) Agreement – Between the tenants of a shared living situation. Standard Residential Agreement – The most common type of rental contract that allows the landlord and tenant to come to a binding arrangement for property. Sublease Agreement – The act of renting space that is under lease from another tenant. The new tenant is known as the subtenant or sublessee and usually the landlord must consent to this type of tenancy. Termination Lease Letter (§ 83.57) – For the cancellation of a month to month agreement which is required to be sent at least fifteen (15) days before the next payment date. Access (§ 83.53) – Landlord Must provide at least twelve (12) hours of notice before entering the tenant’s property. Identification ( § 83.50) – Owner must list themselves or an authorized agent that is allowed to access the premises in addition to receive notices. Fire (§ 83.50) – All buildings over three (3) stories high must be notified of any fire protection. Security Deposit Receipt (§ 83.49) – This Statement must be in every agreement. In addition, after a deposit has been given by the tenant the landlord must notify them within thirty (30) days of where the money is being held and if it is in a interest or non-interest bearing account. Maximum – There is no limit on how much a landlord may request. Returning (83.49(3)(a)) – If there are no deductions from the tenant’s deposit it must be given back within fifteen (15) days. It shall be thirty (30) days if there are subtractions from the amount.